Special Containment Procedures: SCP-1379 is to be kept in a dedicated Object Containment Locker at Site 19, off the floor and covered by a sheet. Personnel should never make any remarks regarding SCP-1379’s appearance, in order to avoid contamination. Personnel who find themselves contaminated with SCP-1379’s influence are to report to their superiors for evaluation, and reassigned to non-experimental work if deemed fit to continue their service to the Foundation. Further action will be taken on a case-by-case basis. At this time, cross-testing is forbidden between SCP-1379 and other SCP objects which contain childlike abnormal entities, such as SCP-097, SCP-747, and/or SCP-899. 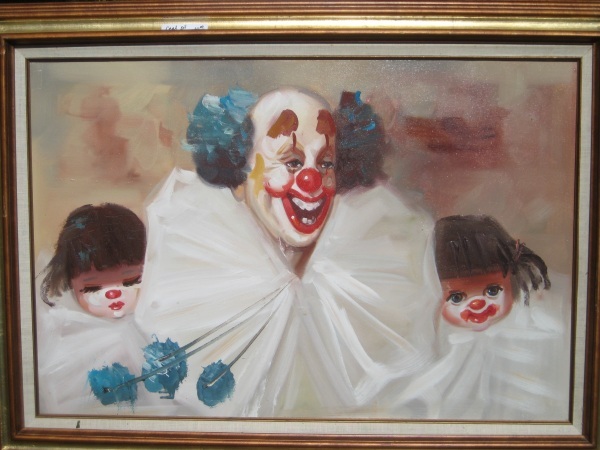 Description: SCP-1379 is a canvas painting of a clown with two children, held in a frame roughly 1.2mx1.5m in size. The object appears to be wholly destructible, and shows some minor scuffing and wear on the edges of the frame. Estimates put the date of creation somewhere in the mid to late 1980s. If any person or persons make disparaging remarks regarding the content of the painting, they will feel a sharp, severe pain in the centre of their chest within the following five to ten minutes, located roughly behind the sternum. This pain will persist for roughly 20 minutes before suddenly ending; as of yet, testing has not determined a biological process or pattern responsible for this pain. After the cessation of pain, the person or persons who remarked on SCP-1379’s content will be irreversibly mentally changed, depending on their biological age. Adult subjects (>~16-17 years) will become unable to experience certain mental states, such as nostalgia and simpler forms of curiosity. Imaginative ability is also dramatically cut, with more creatively inclined subjects losing the will to create or perform as they did before exposure. Additionally, their sense of humour will be dulled, though not completely removed; they simply will no longer find most humourous situations as such. It should be noted that these individuals may find certain forms of humour, such as specific kinds of sarcasm and more sophisticated jokes or puns, entertaining if they did so before exposure. Adult subjects afflicted by SCP-1379 are capable of living relatively normal lives post-exposure, and this effect diminishes the later in life one is affected. Prepubescent subjects (<~12 years) will be affected more dramatically by SCP-1379’s effect. After the cessation of the pain associated with SCP-1379, young subjects will permanently become subdued and highly suggestible, with little interest towards anything not directly related towards their physical survival. The affected subjects will no longer show signs of any imaginative ability or creative potential, as well as an extremely stunted capability for learning non-physical, non-critical skills such as mathematics. Emotional response is extremely subdued as well, with individuals losing the will and ability to form bonds with others, react to humourous or depressing situations, or feel any sort of fear response. These traits will carry into adulthood, with individuals showing little to no changes in mental state as they progress in age. Individuals between 12 and 16 years of age will be affected less predictably than those age groups discussed above, though the effects on this age group appear to vary in accordance with mental maturity levels. Recovery: SCP-1379 was recovered from a yard sale three miles west of Port Huron, Michigan, in 1999, after a high number of civilians were afflicted by its effect. A vast majority of the afflicted were aged 60 or older, and thus were treated with mild Class-C amnesiacs and released. The owner of the property where SCP-1379 was recovered had not seen the painting before, and did not know where it came from. The ultimate origin of SCP-1379 is as of yet unknown.